Designed for inventors and tinkerers, the WeMo Maker makes it possible to control low-voltage electronics devices using a smartphone or tablet. 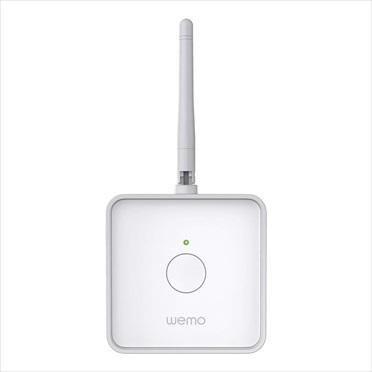 The WeMo Maker works over your home Wi-Fi network and lets you turn your devices on and off, put them on schedules, or connect them to different sensors. An ideal tool for hobbyists who have wiring knowledge and enjoy taking electronics apart, the WeMo Maker can connect to nearly any device controlled with a DC switch (24v at 1 amp or 24 watts max)*. Once connected, the WeMo Maker allows you to monitor a variety of 5v digital sensors with a digital output. To control WeMo devices using your smartphone or tablet, simply download the free WeMo app, available for iOS, Android, and Kindle. Users can then set up rules that manage any WeMo device, based on the status of the WeMo Maker sensor. You can also change Maker's relay behavior between Momentary and Toggle mode to allow for more diverse use-cases. WeMo Maker works with IFTTT, a service that lets you create powerful connections with one simple statement: IF this, then that. You'll be able to use any data source on the web to act as a WeMo trigger and create customized automation rules and schedules to fit your personal preferences. You can, for example, create a trigger to open the pet door for your dog at sunrise or when you log out of your work email for the day. With WeMo and IFTTT, your imagination is your only limit. Belkin's expanding WeMo ecosystem now includes light bulbs, a motion detector, an energy monitoring switch, and even a Crock-Pot slow cooker. With WeMo Maker, technically expert users will now be able to connect any low voltage device into the WeMo ecoystem. Since the system is modular, you can automate as much or as little of your home as you'd like.